This park has been maintained close to its natural state, making it a perfect escape. Rainbow trout fishing is a popular activity. Pinkut Lake is also well-suited to paddling small boats, and has a fish hatchery located at the south end. There are 5 campsites available on a first-come, first- served basis. Please note: This park is cooperatively managed by a community, society or other partner. Services may differ from those offered in other BC Parks. This park is located 24 km north of Burns Lake. Follow Babine Lake Road north of Burns Lake for 20 km. Turn left onto the Augier FSR and follow this for 5 km where the park is immediately adjacent to the road. History: Ethel F. Wilson Memorial Provincial Park is dedicated to Ethel F. Wilson who unstintingly gave time and energy for the benefit of others, especially the young people of Burns Lake District, where she resided from 1930 until her death June 14, 1952. Approved Ethel F Wilson Memorial Provincial Park Management Direction Statement [PDF]. Because of the large size of the maps, they have been listed separately. 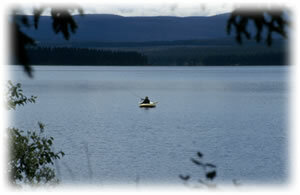 There are paddling, canoeing and kayaking opportunities on Pinkut Lake. Rainbow trout fishing is a popular activity. Pinkut Lake is also well-suited to paddling small boats, and has a fish hatchery located at the south end. Anyone fishing or angling in British Columbia must have an appropriate licence. This park has a day-use area. This park only has a pit toilet, no flush toilets. There are 5 drive in campsites available on a first-come, first-served basis. There is no fee for camping.